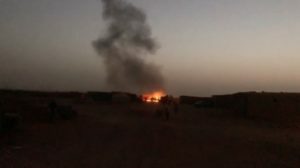 The Tindouf camps are in turmoil following bloody clashes Saturday between factions of the Rguibat tribe over ownership of a plot of land at the intersection of the Farcia and Jdayria circles, in the so-called “Smara” camp. The clashes caused serious material damage, according to concordant sources and videos relayed on social networks. Three people suffered serious burns and a house and four tents were burnt down. The clashes where bladed weapons were used also left 17 people wounded among the protagonists and 9 members of the pseudo “police”. The Tindouf camps have been shaken over the past weeks by demonstrations and sit-ins staged by hundreds of Sahrawis to protest their appalling living conditions and tightened restrictions to their freedom of movement decreed by Algerian authorities, since February 22, when demonstrations against the Algerian long-ruling regime started in Algeria. Posted by Hafid El Fassy on April 14, 2019. Filed under News, Zoom. You can follow any responses to this entry through the RSS 2.0. Both comments and pings are currently closed.